Aluminum office. 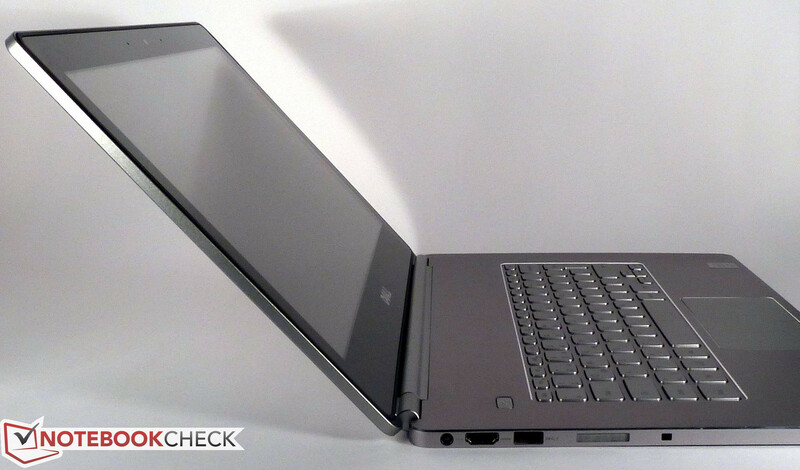 Dell's Inspiron 14-7437 is an aluminum ultrabook with a touchscreen as well as Windows 8 and reminds us of a MacBook. How does it perform in our review? 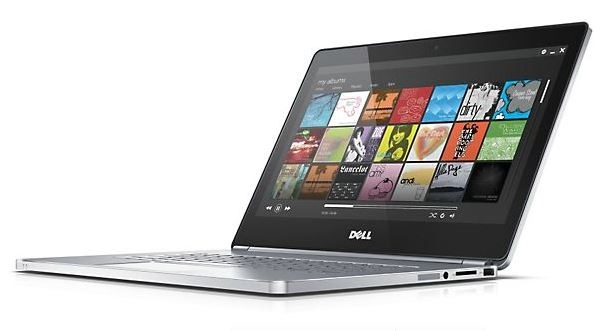 A bit boxy but with shiny silver aluminum and a glossy touchscreen for the preloaded Windows 8 - that is the Dell Inspiron 14-7437. The specifications of our review unit sound promising: A ULV processor from Intel's current Haswell generation, sufficient memory and a fast SSD. The appearance is dignified and restrained, perfect for the office environment. Dell currently offers our review unit for 999 Euros (~$1374). Nevertheless, is that enough to compete with rivals like the Lenovo U430 or the Toshiba Satellite U840T-101? Our in-depth review will give the answer. Dell uses aluminum and the light alloy really lives up to its name: The Dell Inspiron 14 is conveniently light, easy to transport and the stability is very good. The flexible display hinges are a nice addition. Unlike a convertible, you cannot flip the display completely, but 180 degrees are no problem. The hinges do a good job and keep the display in position well. 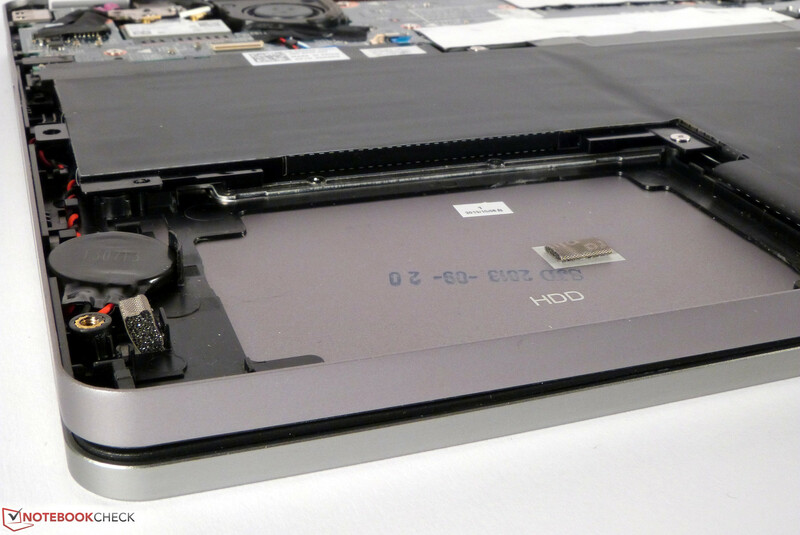 The thin construction also resulted in the compact and compressed internal layout of the Inspiron. The battery is screwed inside the case and it is not easy to replace it - even after you remove the maintenance cover. Maintainability in general was not very important for Dell. You can remove the bottom cover and access the components, but the whole process is not very easy. 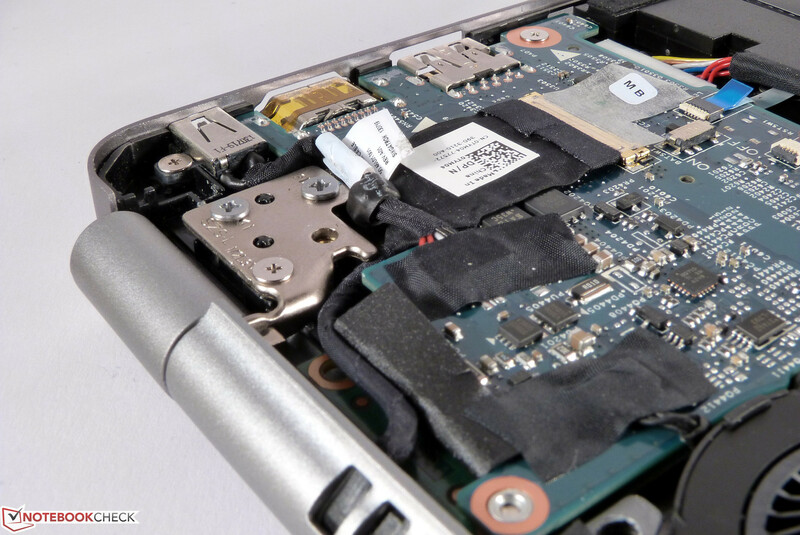 Friends of many ports will be disappointed by the Inspiron 14. The manufacturer only integrates two USB 3.0 ports - one each on the left and right side of the case, as well as one HDMI-out, one SD card reader and a stereo jack. Neither an Ethernet port nor a Kensington Lock is available. This limited port selection can be a problem, especially with the lack of a docking port. One wireless mouse or one USB stick already occupies 50 percent of the USB ports, so you will probably have to use a USB hub quite often. One advantage however is the port layout. 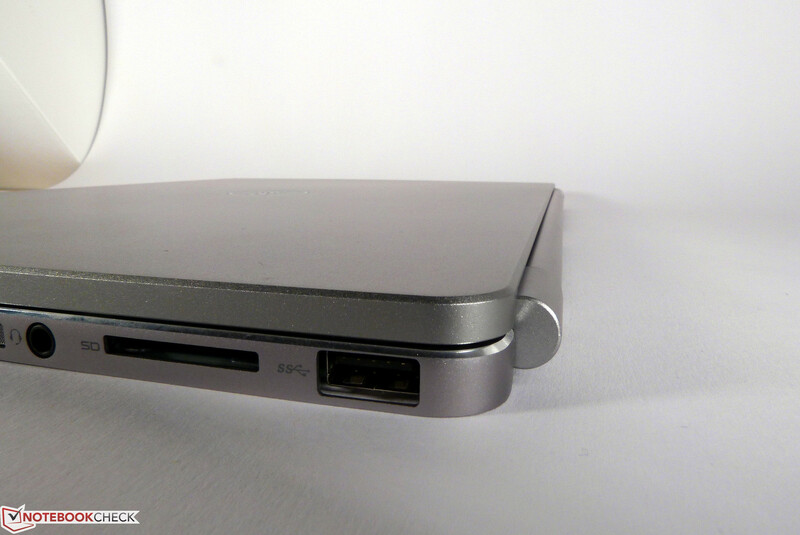 All the few ports are in the rear area of the sides, so attached cables will not be a problem when you use a mouse. 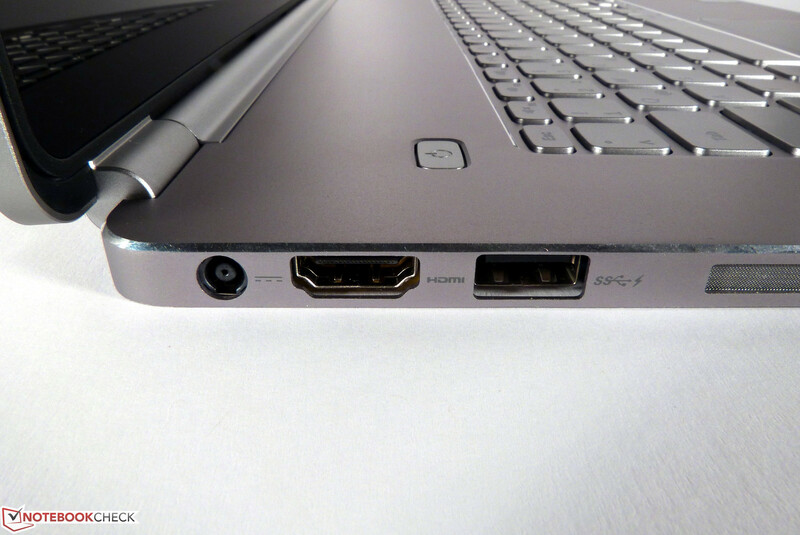 Due to the lack of an Ethernet port, the user of the Dell Inspiron 14-7437 will have to use the wireless modules of the ultrabook - or an appropriate USB-LAN adaptor. That leaves the Intel WLAN adaptor 7260, which supports both 2.4 GHz and 5 GHz networks as well as Bluetooth. The signal quality in the individual setup of our editor was inconspicuous, but in a positive manner: The notebook still had a connection two floors away from the router with a gross transfer rate of around 144 Mbps (2.4 GHz). An application from McAfee is preloaded, which requires a registration with the manufacturer, but only works for 12 months without an additional fee. Instead of the standard Kensington Lock that is used for many devices, Dell decided to integrate a Noble Security Lock. The Inspiron 14 does not come with many accessories. Besides the notebook, a small power supply unit and some warranty information there are no additional extras. There is no docking port; you will therefore have to use a standard port replicator to expand the meager port variety. Dell does offer relevant products in its online shop, but (less expensive) products from other manufacturers work as well. 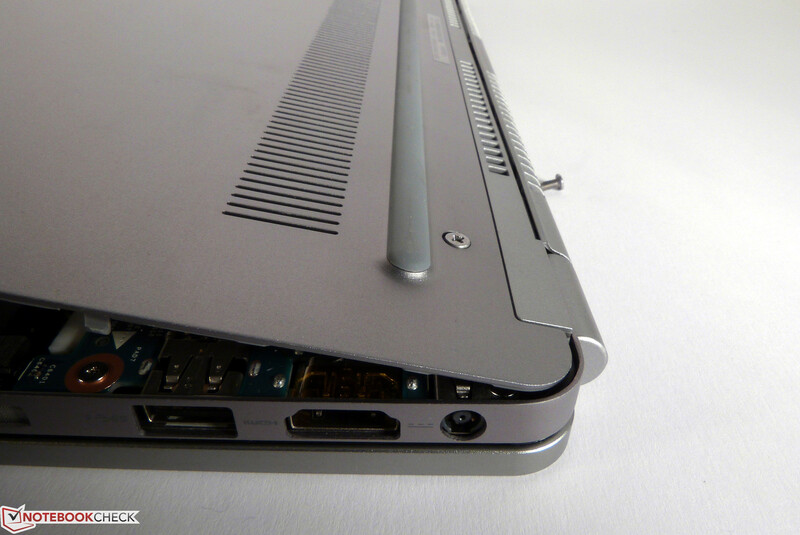 Dell's ultrabook is not perfect in terms of maintainability. You can remove the whole bottom cover after you loosen some screws, but this process is rather fiddly and does not work without a sharp object to lift the cover. 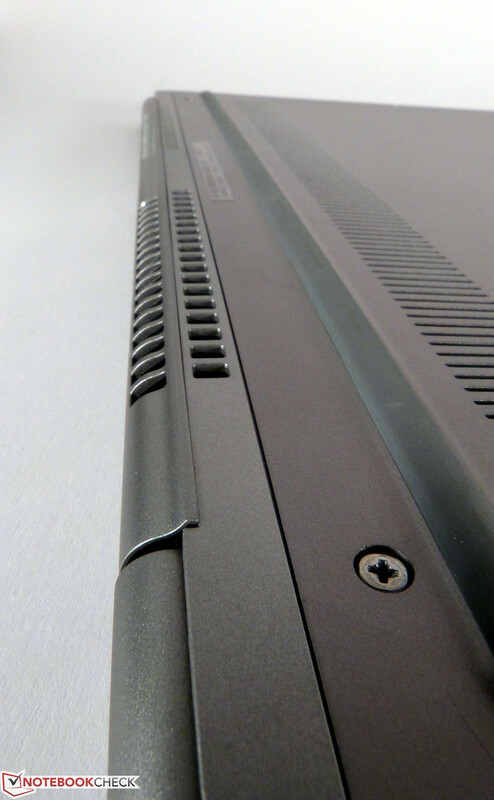 This cover is only secured by a few plastic clips and is very thin in the area around the ventilation fins, so it might be best that Dell service performs this operation, as this is the way the manufacturer obviously intended it. 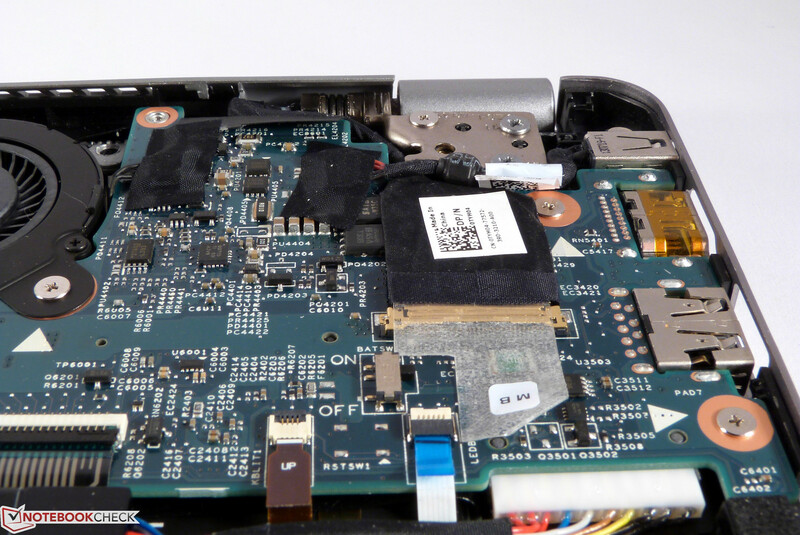 The memory and WLAN module can be replaced if necessary, but the battery is integrated. The free hard drive bay cannot be used because there is no standard SATA connector. You can however clean the fan and the cooling unit very easily. The Dell Inspiron 14-7437comes with 90-Day Premium Phone Support and 12-month In-Home service after remote diagnostics. For an additional $39 you can extend the phone support to one year, but you can also get this enhanced support for two, three and four years. The additional charge for these packages is $89, $149 and $249, respectively. 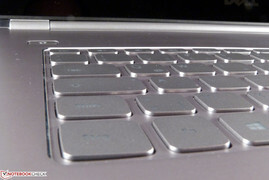 Similar to the case of the notebook, the keys of the chiclet keyboard are also silver colored. The lettering is not printed but transparent and illuminated by LEDs. The intensity can be adjusted in three steps - but the keys are not easy to see without the illumination even in the half-light. The LED illumination is a bit inconsistent and some keys appear slightly darker than others, while the arrow keys are especially bright. Even though the typing experience of the keyboard is okay, it will take a lot of time getting used to it. It is really hard to identify the problem though; the keys have a normal size and the layout is not unusual, either. There is however a noticeable amount of flex, which also results in a point deduction in this section. At least the key travel is otherwise okay, the size of the return key is normal and the other keys are not too small, either. 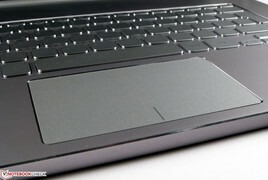 The touchpad is sufficiently sized and comparatively wide, while a conveniently roughened surface improves the handling. 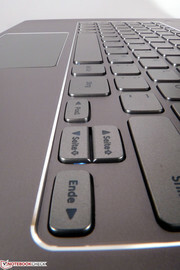 The two mouse buttons are at the bottom of the touchpad, but they are not highlighted. 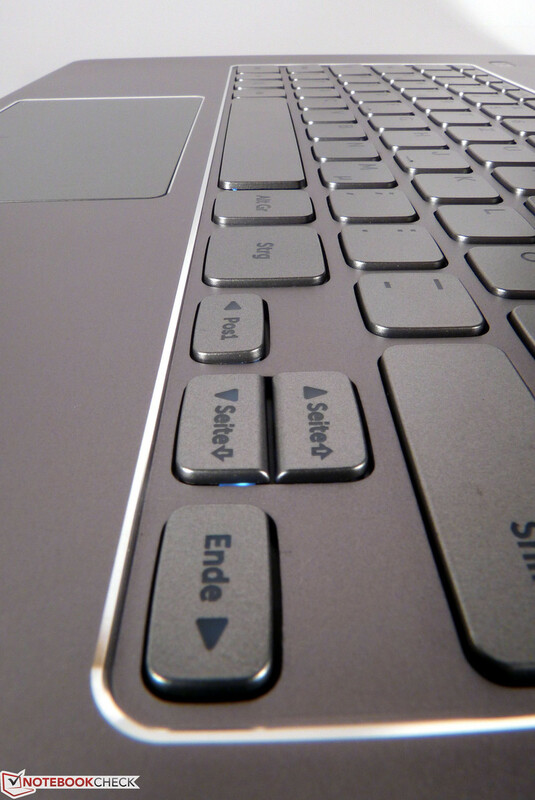 Only a small black line on the touchpad indicates the two buttons, but they work reliably in return. Gestures are supported by the touchpad, which makes the handling of the preloaded Windows 8 very convenient. It might appear redundant to get an additional touch input besides the touchscreen, but it is not always the fastest solution to use it. The 14-inch display is provided by Chi Mei and has a resolution of 1366x768 pixels. We can see deficits in terms of brightness (average just around 190 cd/m²), which is especially annoying because the touchscreen surface requires a glossy layer. The contrast ratio of around 700:1 however is okay. The formerly mentioned rivals are not much better either. 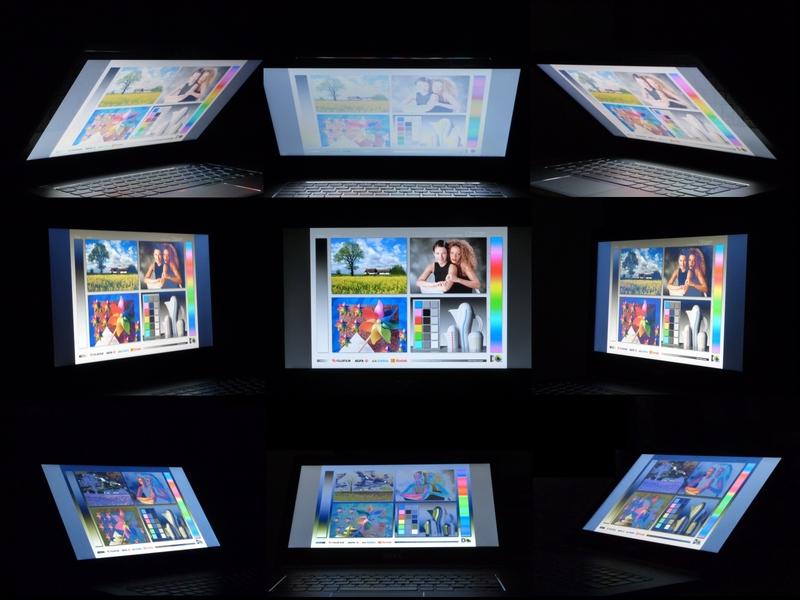 Toshiba's U840T is comparatively bright and has a higher contrast of 860:1 as well. Lenovo's U430 has more pixels and its display is also slightly brighter with 196 cd/m² on average, but the contrast is noticeably lower with 430:1. Color coverage is not really overwhelming and you should look for another device if you are into professional picture or video editing. We can only measure an AdobeRGB coverage of 37.6 percent and 54.82 percent of the sRGB color spectrum. The display quality is however sufficient for office and multimedia purposes. Our color accuracy measurements indicate an average performance of the Inspiron 14. The average deviation is very high with a DeltaE value of 10, but we can even see a maximum of 18. The same applies to the grayscale presentation with an average DeltaE-2000 deviation of 11. Our measurements also show a clear shift towards blue and we can confirm a visible blue cast. You should avoid direct sunlight when you work outdoors. Glossy displays in general are not ideal for outdoor work. It is often hard to see the display content, especially in combination with the low brightness. But the problem is not limited to sunlight, even a badly positioned lamp can be enough to complicate the situation. Unfortunately, Dell uses such a combination of low brightness and glossy display surface, so an outdoor use only makes sense after the sun went down. This is very annoying, because an ultrabook like the Inspiron 14-7437 is otherwise a very portable machine. 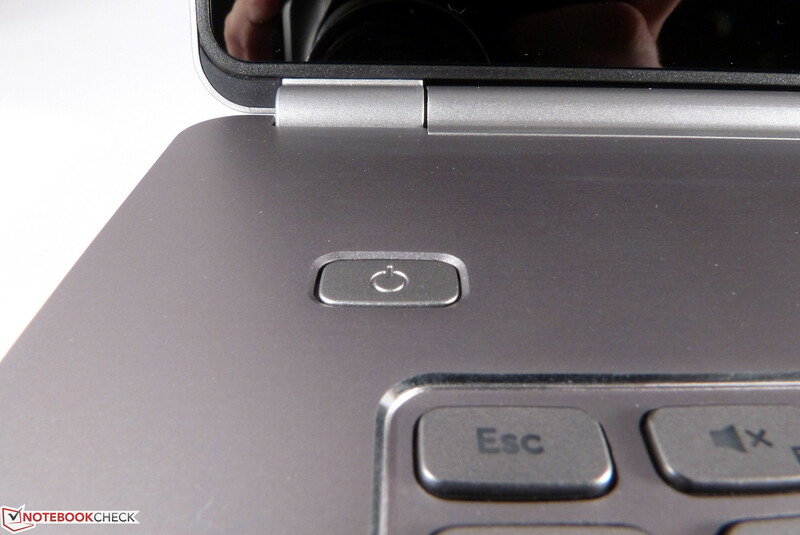 The viewing angle stability of the Inspiron 14 is disappointing. 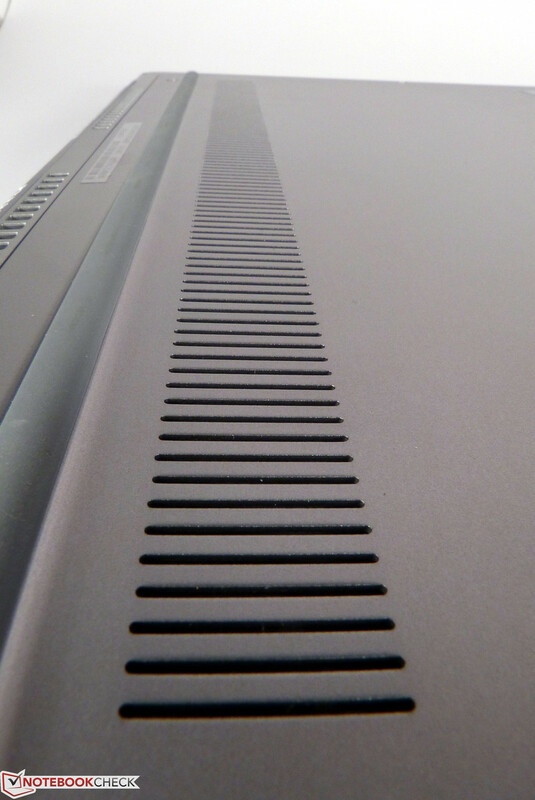 Even small vertical changes of the viewing angle will result in inverting colors. This means you will have to adjust the display position quite often. Dell equipped our review unit with an Intel ULV CPU from the current Haswell generation, which is supported by 8 GB memory. That ULV processors are only sufficient for undemanding tasks is not true anymore; working with the Inspiron 14 is a very smooth experience. An important factor for this impression is the 256 GB SSD, which not only improve the system and application launches, but it also provides a very snappy and smooth system performance. Graphics are handled by the Intel HD 4400 GPU; the small sibling of the HD 4600 is slightly less powerful, but is otherwise identical and supports all the important features including the video transcoder Quicksync. The Inspiron is well suited for common office and simple multimedia tasks. 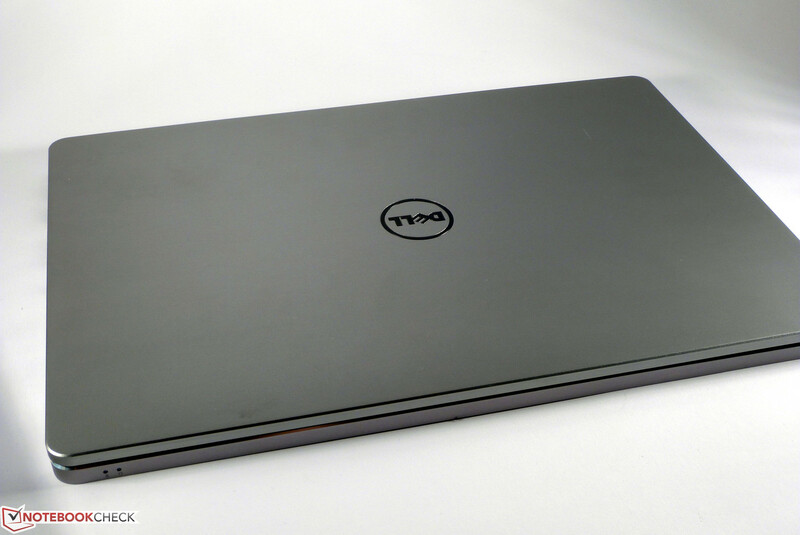 Dell also offers less expensive configurations of the Inspiron 14 7000-series with a lower clocked 4200 processor as well as less memory and a mechanical hard drive instead of an SSD. However, we would not waive the SSD, even though the cheaper versions do at least have an SSD cache. 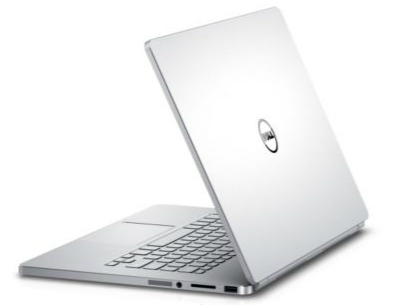 Depending on the configuration, Dell equips the Inspiron 14-7437 with an Intel Core i5-4200U or a Core i7-4500U. Our review unit uses the faster i7 version, which has a higher clock as well as 1 MB more L3-Cache. Intel's Core i7-4500U is a ULV processor from the current Haswell generation and has a nominal clock of 1.8 GHz, which can be raised up to 3 GHz via Turbo Boost. The resulting performance is predictably high and far away from older ULV processors. Thanks to the Turbo Boost, smooth operation is no problem at all. The dual-core CPU also supports Hyperthreading to execute four threads simultaneously. Intel also provides the integrated HD Graphics 4400 GPU. Its main purpose is not exactly gaming, but it offers more than enough performance for everyday tasks and even supports video transcoding via Quicksync. Despite the comparatively high CPU performance, Intel only specifies the TDP with up to 15 Watts, which is also possible because of the 22 nm manufacturing process. 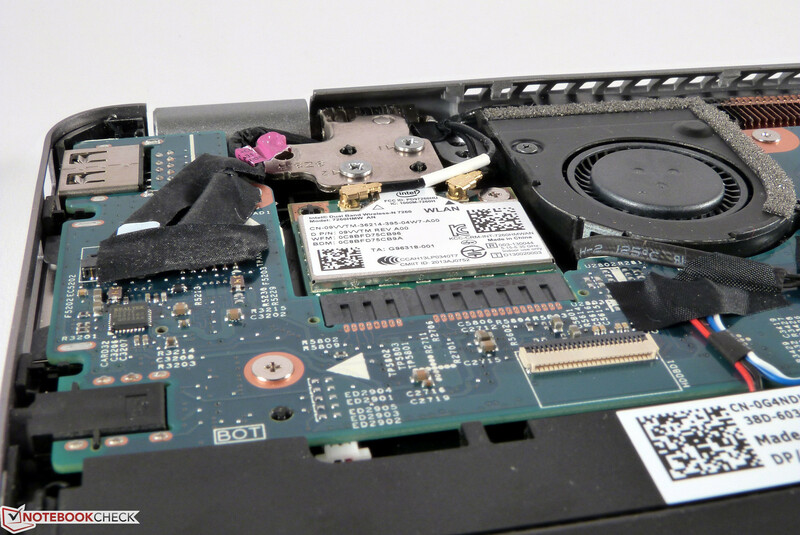 The cooling solution of the Inspiron is pretty powerful for a 15 Watts CPU and results in cool temperatures and high Turbo clocks. Compared to other notebooks with the identical CPU there are no performance issues. 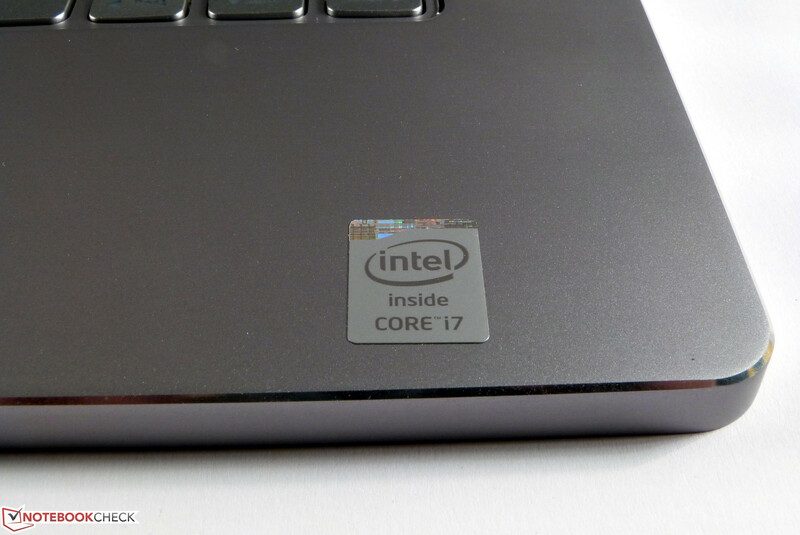 Intel's i5-4200U is around 10-15 percent (multi/single CPU rendering) behind the i7 of our review unit. Even 15-Watt processors like the Core i7-4500U have no performance problems nowadays. Combined with a fast SSD and an appropriate amount of fast memory, the CPU is more than powerful enough for daily tasks. This combination does not get new PCMark 7 high scores because the CPU only has two moderately clocked cores. It is however sufficient for office tasks, web browsing as well as picture and even video editing. The latter benefits from Intel's Quicksync, at least if the application supports it. It is a good decision to get the Inspiron 14 with an SSD. 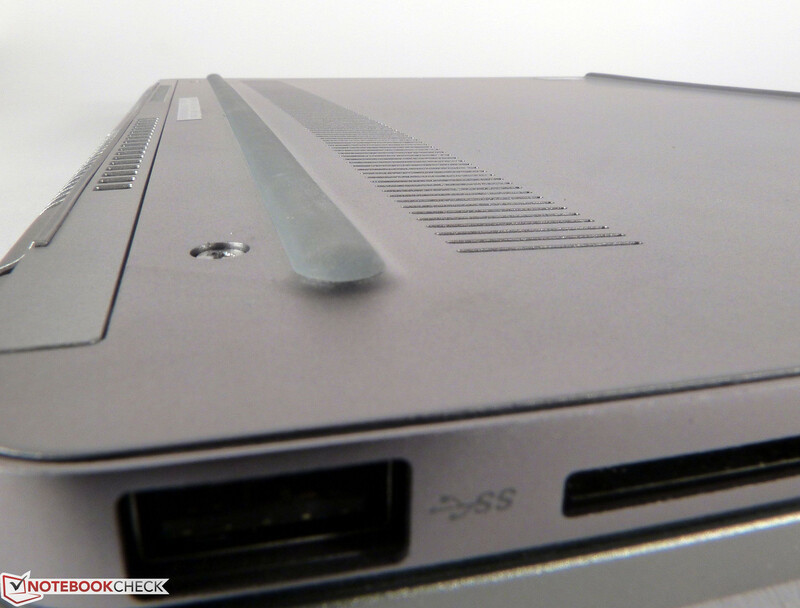 Even the less expensive configuration of the ultrabook has a small cache SSD, but the 256 GB SSD in our review unit does provide low access times for all processes. We can see the impact of the SSD in the application benchmarks as well; notebooks with a conventional hard drive cannot keep up. Compared to similarly equipped notebooks (CPU, RAM and storage) however, we cannot determine any issues with the Inspiron 14 and the performance is at the expected level. Choosing an SSD instead of a standard hard drive does result in less available storage capacity, but the performance is much better in return. The choice of a familiar Micron/Crucial drive also eradicates the concern about sudden data loss. Sequential transfer rates of the SSD are very high with around 500 MB/s (read) and more than 200 MB/s (write), respectively. The drive also showed good results for the 4K tests. The subjective working experience of the ultrabook is very good. Contrary to the Intel HD Graphics 4600 that is used in many Haswell desktop processors (standard voltage), the i7-4500U only uses the less powerful HD Graphics 4400 with reduced clocks - this applies for the Turbo clocks as well. Because of the low TDP it is difficult to reach high clocks, so we won't see the maximum clock of 1,100 MHz very often. Dell at least uses fast DDR3-1600 memory in a dual-channel configuration that should be a bit faster than DDR3-1333 RAM and therefore improve the GPU performance as well. 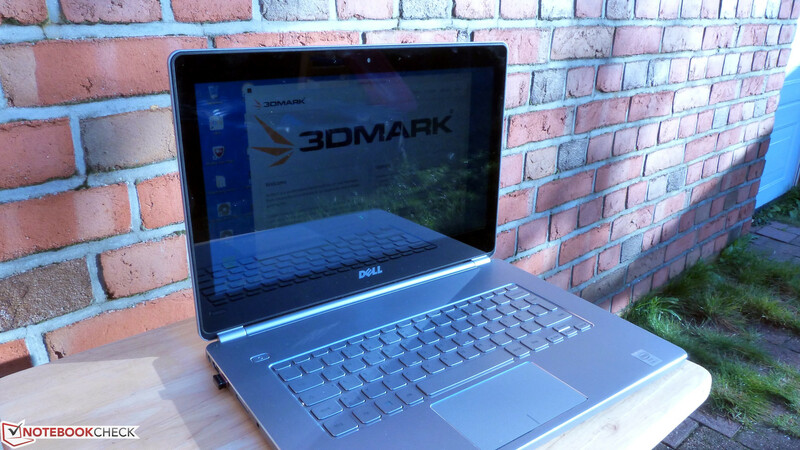 A comparison with similarly equipped rivals shows a top position for the Inspiron 14 in 3DMark 13. Our gaming benchmarks confirm that the Intel HD 4400 is not really suited for gaming. Only older games run somewhat smoothly, but the performance of the Intel GPU is not sufficient for current titles or very GPU demanding titles like Crysis 2. The Inspiron is really quiet during idle and with light workloads; we can only measure up to 30.4 dB(A) from the small fan. You should expect this system noise during usual office tasks. 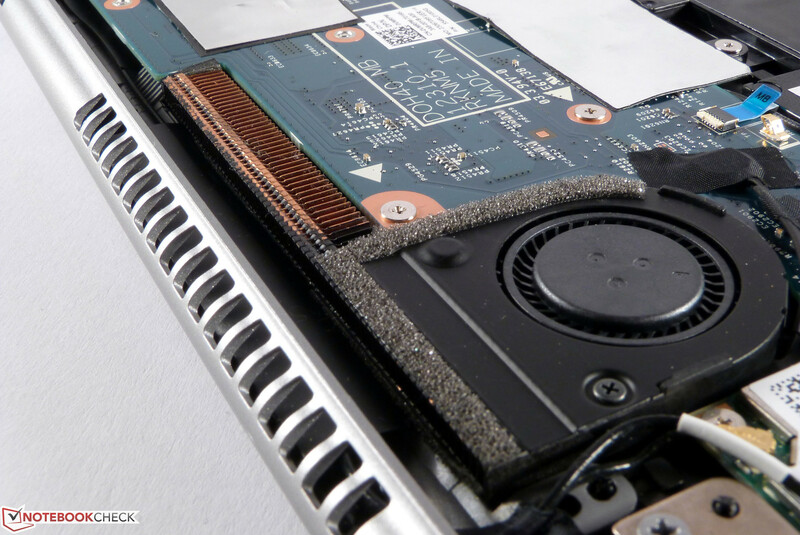 Even if the fan is running all the time, the notebook is almost inaudible with light workloads. That does however change with more complex applications. The fan spins up to 40.9 dB(A) under load and does create a steady and almost annoying noise. Razer's Blade is a similar concept but it is much more powerful, however, it does not get much louder under load, even though it has to dissipate more than 100 Watts instead of just 28 Watts. Dell should have fixed this problem. ULV processors are not known for their wasteful energy consumption (and therefore heat). 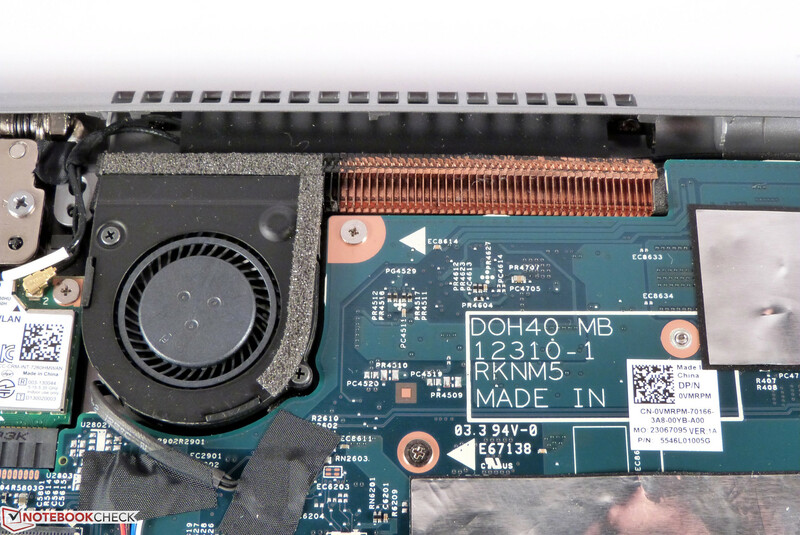 A TDP of just 15 Watts for the CPU and GPU should not be a big challenge for a cooling solution of a notebook. 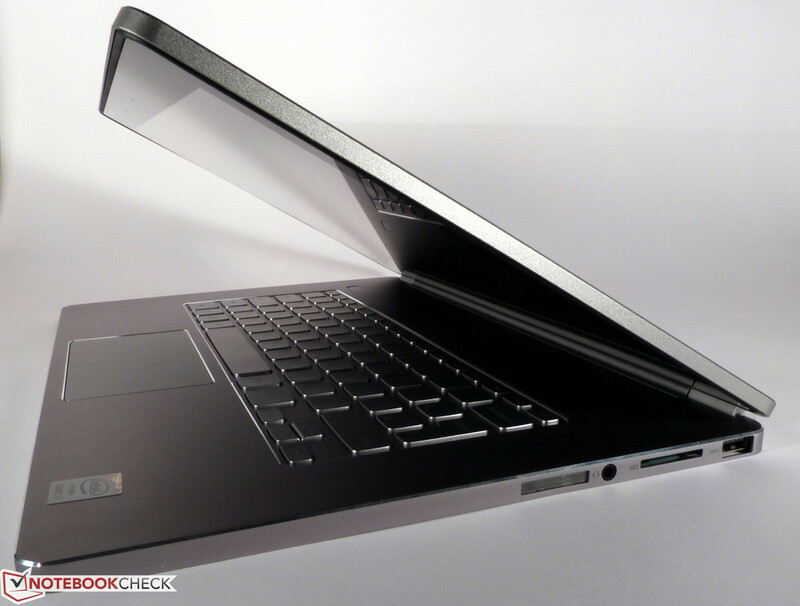 The numerous energy-saving features of the Haswell generation have a positive effect on Dell's ultrabook. Only 28 degrees Celsius (82.4 Fahrenheit) in the area of the fan exhaust with an ambient temperature of 22 degrees Celsius (71.6 Fahrenheit) is a very good result. 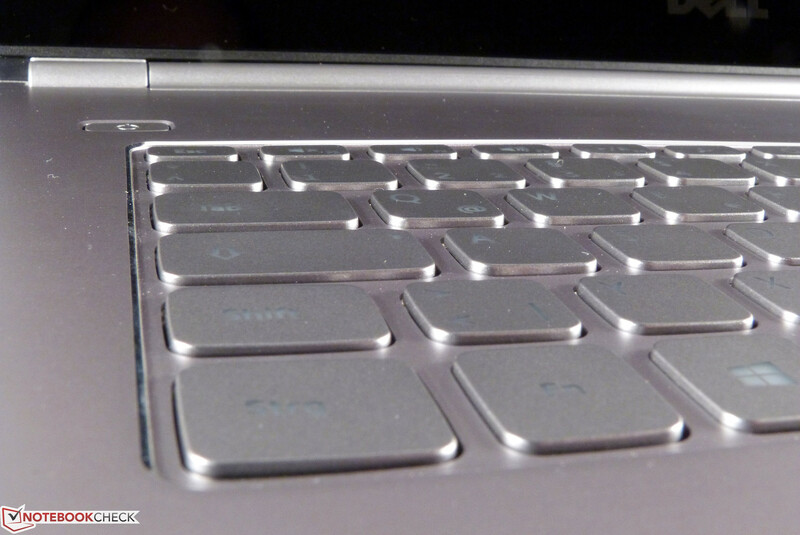 The ultrabook with the cool aluminum surfaces actually stays very cool with light workloads. This changes once again under load with up to 42.8 degrees Celsius (109.04 Fahrenheit) at the fan exhaust. The area beneath the display is almost inconveniently warm. This is however not such a big problem in practice, because Dell can effectively keep the heat away from areas that the user touches. This includes the bottom as well, and using the notebook on your lap is no problem with up to 40 degrees Celsius (104 Fahrenheit). However, you have to keep in mind that this temperature is a result of our impractical extreme scenario. Our stress test with FurMark and Prime95 simultaneously for a couple of hours results in a reduced CPU clock of just 1.1 GHz, while the GPU seems to use a big part of the thermal budget. As soon as we stop FurMark we can see Turbo clocks of 2.5 and 2.6 GHz for the CPU. 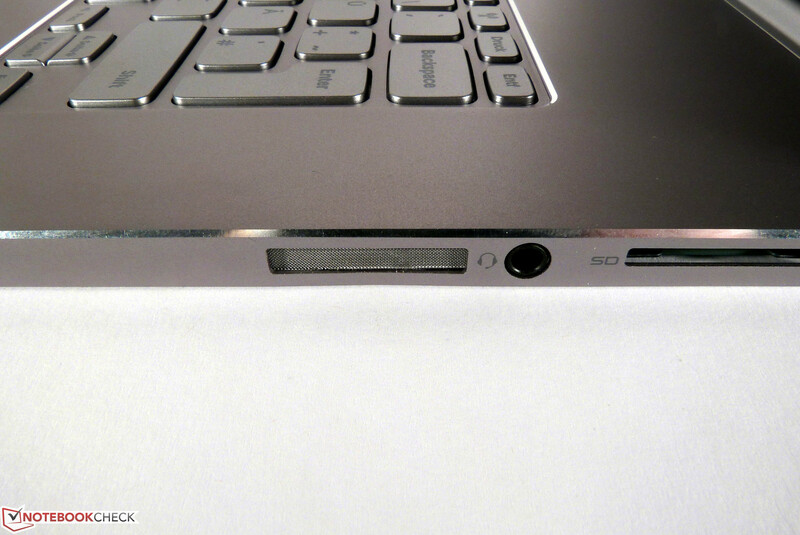 Dell integrates two small speakers at the sides of the notebook and the resulting stereo sound is okay. Considering the tiny speakers, the sound experience is actually satisfying. We can only hear distortions with very high volumes. 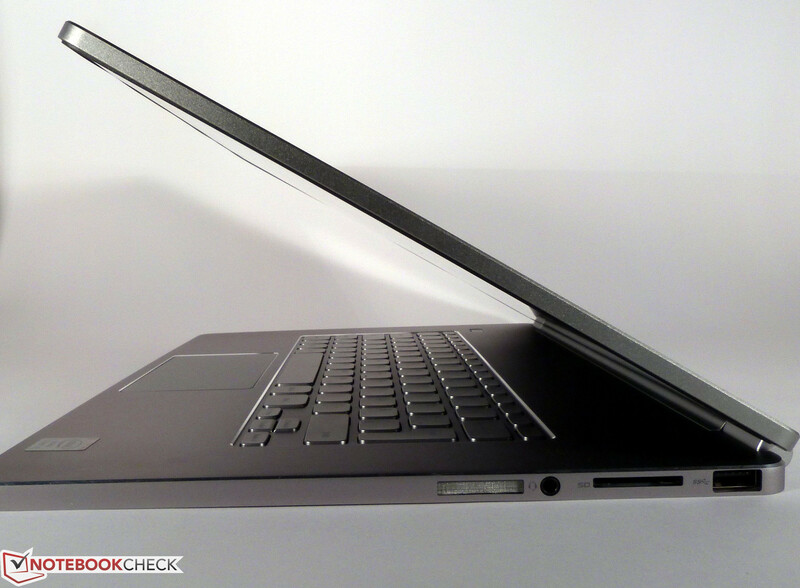 You should not expect bass, but the speakers create powerful medium tones - more than many other ultrabooks. It is sufficient to watch a movie or listen to web radio. The preinstalled MaxxAudioPro software is supposed to improve the sound experience. However, the software does not really do anything apart from some effects that distort the sound. You should also avoid the bass settings or the situation will get even worse. 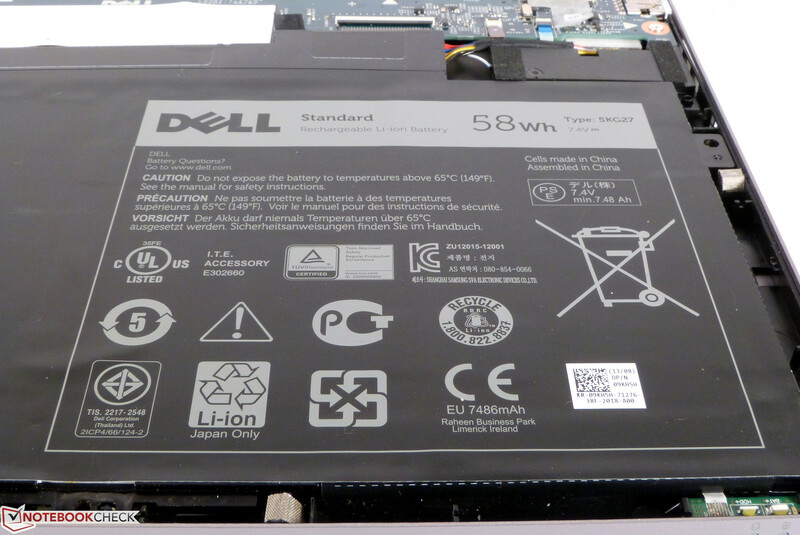 Dell only equips the Inspiron 14 with a slim power supply unit and a comparatively low output of 45 Watts. This is however more than enough for the notebook; the actual consumption under maximum load with FurMark and Prime95 is 28.2 Watts. The consumption obviously drops with light workloads. We can measure 4.4 Watts during idle without WLAN, minimum display brightness and activated energy-saving mode. A higher brightness and a balanced power plan result in 5.8 Watts, while the high-performance energy profile and activated WLAN consume 6.5 Watts. 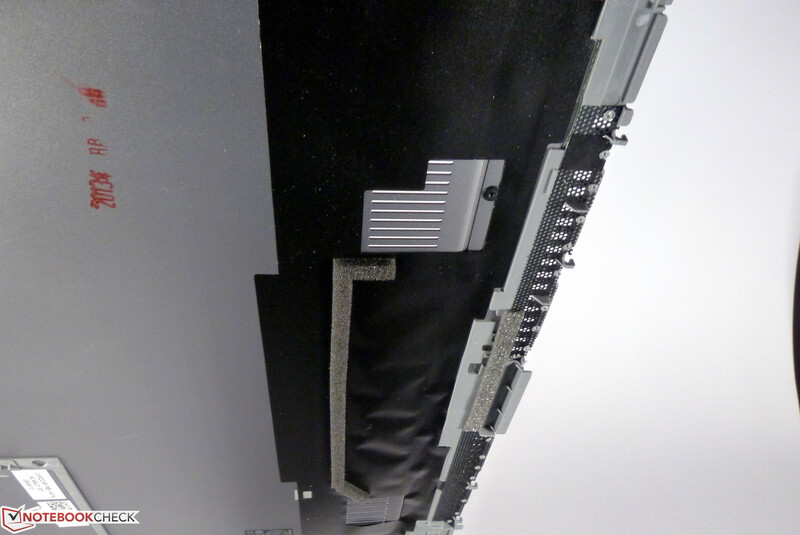 The 58 Wh battery provides good runtimes for the ultrabook. Intel did a very good job with the Haswell processors and especially the ULV versions. They managed to find a good balance between sufficient performance and long battery runtimes. We measure the idle runtime with deactivated wireless connections and minimum display brightness. The Inspiron 14 manages more than eight hours - or 563 minutes to be exact. However, this runtime is not very realistic since you will probably use the notebook from time to time. A more practical scenario is simulated by our WLAN test, which refreshes a website every 40 seconds via a script. Thanks to the integrated video and Flash components, the result should be a very good indicator. The battery lasts for almost 6.5 hours (389 minutes) - a very good result for the Inspiron that should be sufficient for almost the entire working day. Full HD movie playback with an .mkv file is possible for more than five hours. Maximum load for the processor and the graphics card obviously reduces the runtime to around two hours, but this is still reasonable for an ultrabook. Dell's Inspiron 14 is an interesting ultrabook with prices starting at 799 Euros (999 Euros for the reviewed configuration with a 256 GB SSD and a Core i7-4500U CPU; ~$1099 and $1374 respectively). Weight and size are reasonable, the aluminum case leaves a high-quality impression and the touchscreen completes the feature list. The runtimes of the - unfortunately non-removable - battery are also very good. 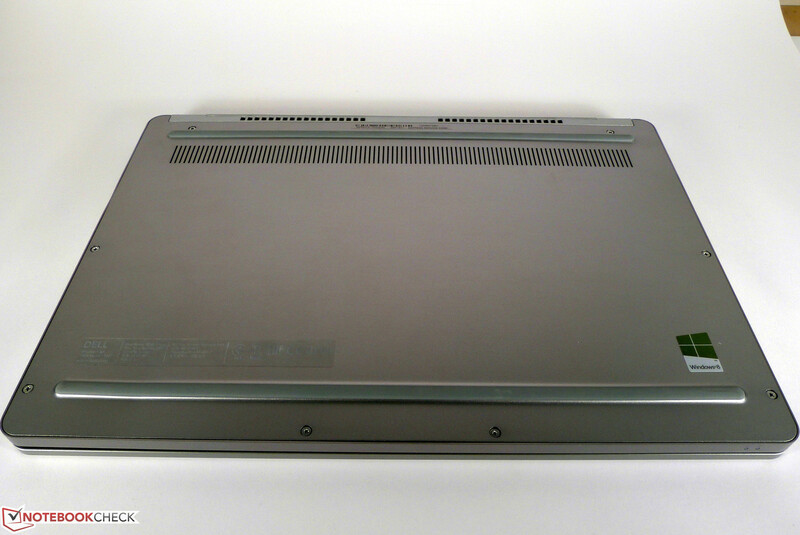 The performance of the ULV processor is sufficient for the usual office tasks as well as web browsing and Dell fortunately did not save money in regard to the storage equipment. The 256 GB SSD improves the system performance as well as the system and application launches. Only the display cannot keep up with the other components. The Inspiron 14-7437 can also be equipped with a Full HD display, but this option is limited to the United States. However, the SSD is unfortunately not available in the United States. Dell should improve the brightness, the contrast and the viewing angle stability of the touchscreen, because it does not work really well outdoors. Another drawback is the limited port selection - two USB ports are just not enough if you are not using the touchpad only. The system noise could be lower as well - at least you cannot hear the notebook with light workloads. 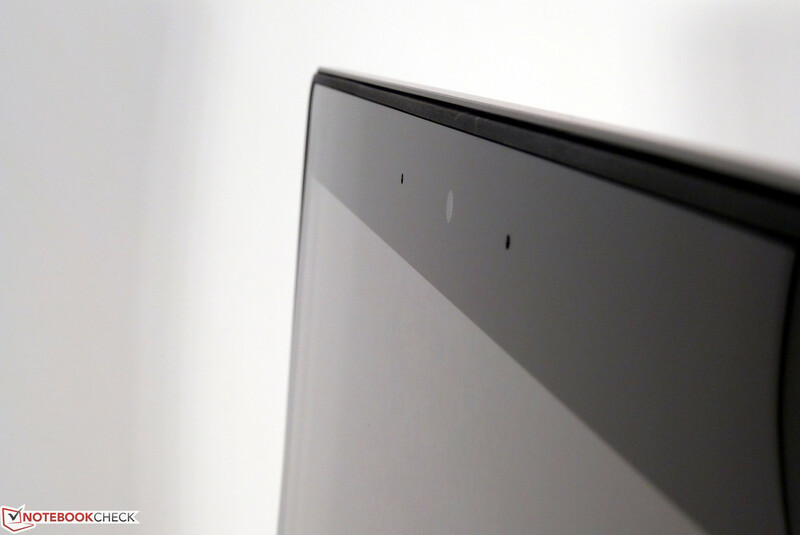 Thin, portable and powerful enough - but Dell should improve the display. Convenient typing experience, but you have to get used to it. The fan exhaust is at the back. 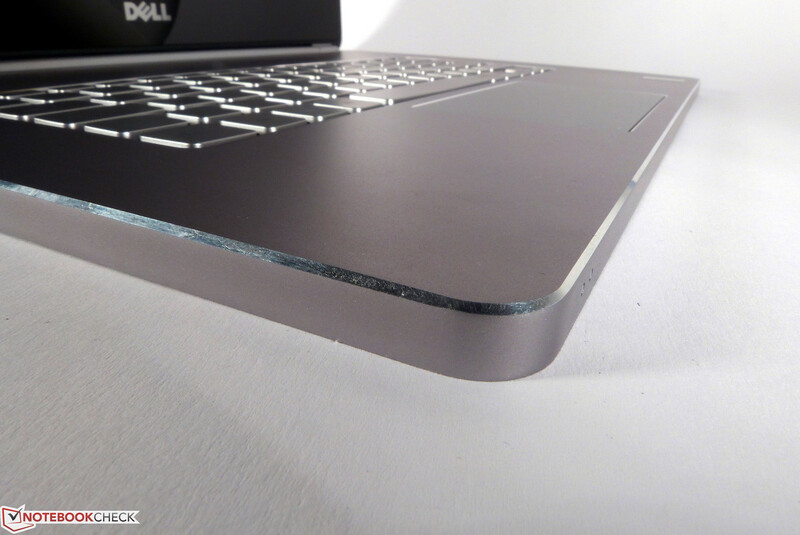 You should use the Inspiron 14 on a flat surface and not on a blanket or you will affect the air flow. The bottom cover has to be removed before you can access the components, but that is easier said than done. The bottom cover is not really stable. The battery has a capacity of 58 Wh and is screwed inside the case. It is therefore not intended that you replace it. 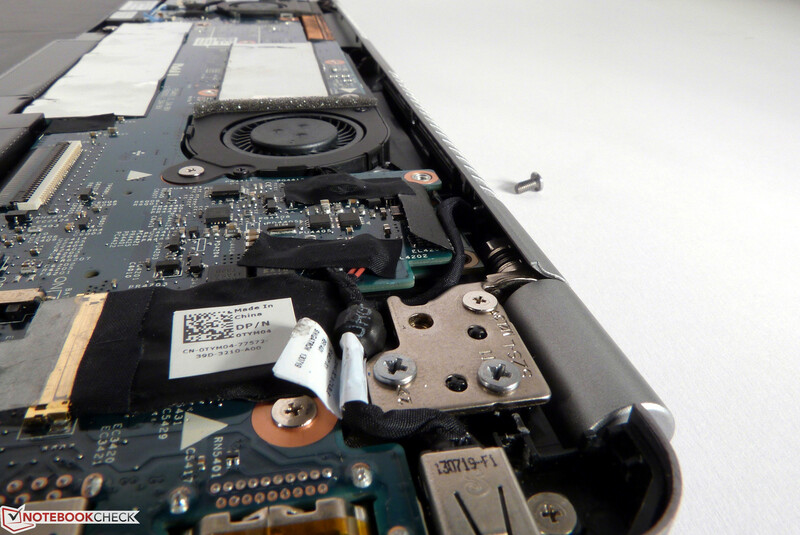 An empty hard drive bay raises attention - unfortunately, there is no standard SATA connector. The internal layout is clear but not ideal for maintenance. Memory and WLAN module on the other hand can easily be replaced. Cables and connectors are hidden behind covers. 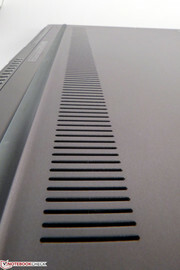 The fan does not have to dissipate a lot of heat, but it is still quite noisy under load. Positive: Fan and cooling unit can be cleaned very easily. The WLAN module is provided by Intel and works reliably and without problems. The Inspiron does not get much air from the bottom. Aluminum everywhere - even the power button is no exception. We can see the protruding hinge when the notebook is closed. The two stereo speakers do not create a cinema-like sound experience, but they are sufficient for everyday tasks. 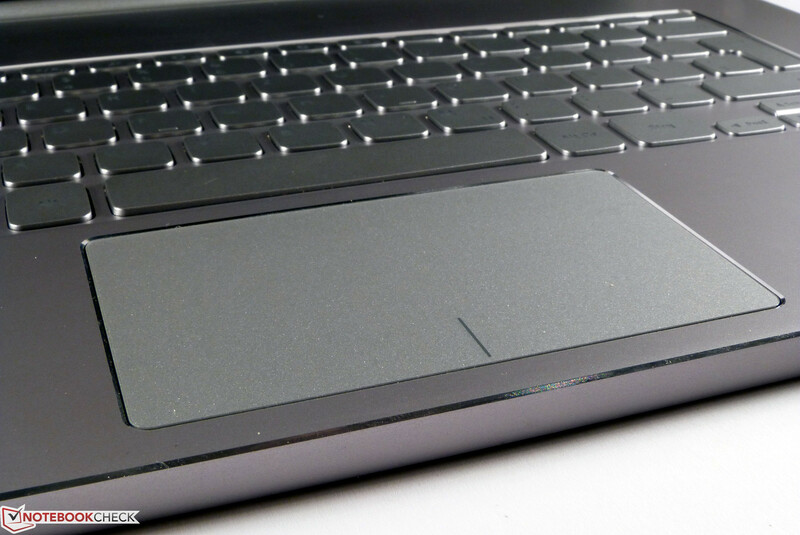 The touchpad however is very convenient and has good gliding capabilities. Simple: The bottom of the Inspiron 14. Also simple: The quality of the integrated webcam. They are actually a bit too firm. Only a few slots, some of them are stuck together, provide the fresh air. Only one sticker for the integrated components. The rounded edges are very stylish. Only 2x USB is pretty meager nowadays. Apart from that, Dell delivers a solid ultrabook. The long battery runtimes and the nice aluminum design. Ports! Two USB ports are often insufficient. Nice notebook, poor display. Unfortunate.